Above: The simple, streamlined box is consistent with the Suqqu aesthetic. After a couple of weeks of eager anticipation, I finally received the Suqqu Frame Fix Cream Foundation (N version) in shades 002 and 003. Prior to placing my order, I had read a couple of compelling reviews on this formula, including that of Shameless Fripperies as well as a mention from another favorite beauty blogger, Rae, of The RAEviewer. Above: Yes, I'm afraid that all of the ingredients as well as directions for use are in Japanese...any help in the translation department would be greatly appreciated! Since my adoration of foundation knows no bounds, I tenaciously tracked it down on my preferred Asian skincare and cosmetics website, Bobo Dave, which, to my utter glee and delight had both shades available for immediate shipment. To be abundantly clear, this foundation is pricy...a single one ounce jar shipped from Hong Kong to Los Angeles ran about $137...fortuitously, Bobo Dave was running a Suqqu promotion that waived the shipping cost when two Suqqu products were ordered. Suqqu Frame Fix Cream Foundation can also be ordered effortlessly online through Selfridges, which now boasts international shipping! Above: 002 and 003 resplendent in the sunshine. As the result of hours of research, I surmised that shades 002 and 003 would be the best options for my NC 25 skin tone (that morphs to as light as NC 23 in the depths of winter and as dark as NC 30 by the tail end of summer). Housed in a one ounce frosted glass jar, the foundation is protected by a stopper lid (shown in the video review later in this post) but I prefer to decant a bit of both shades and put it into a foundation sample jar so that the foundation is not constantly exposed to the air with each application. 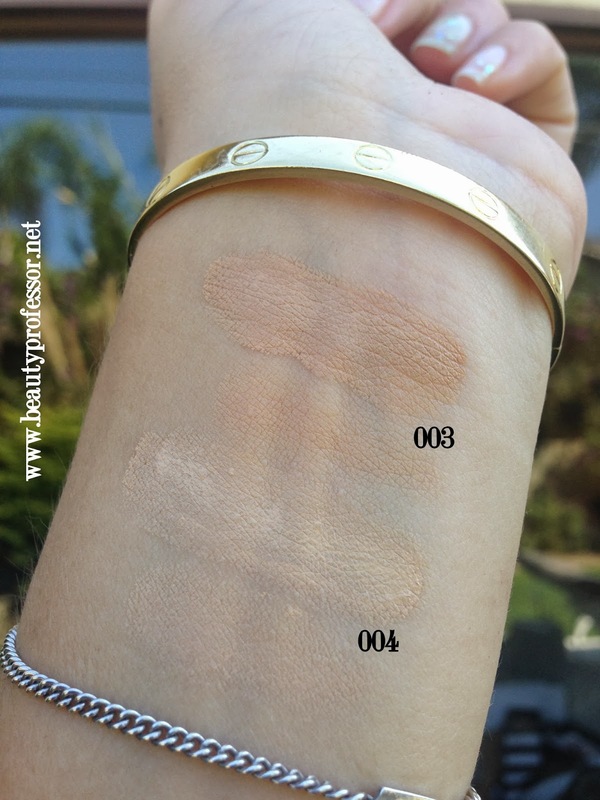 Above: Suqqu Frame Fix Cream Foundation in shades 002 and 003 respectively. 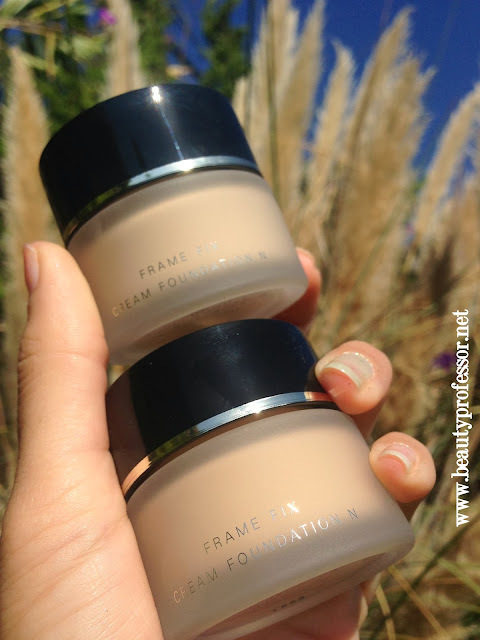 Texturally-speaking, this foundation certainly lives up to its "cream" moniker. It is lush and cushiony, but lacks the typical "silicone slip" of many current cream formulas, which is a refreshing quality in my opinion. It is densely pigmented (though, not as concentrated as the Ardency Inn Custom Coverage Concentrate or Kevyn Aucoin Sensual Skin Enhancer) and a little goes a long way in achieving a buildable medium to full coverage effect. There is no perceptible fragrance (thankfully!) and, upon application (which is also demonstrated in the video later in this post), my skin feels healthy, comfortable and able to breathe. The finish is a radiant, skin-like matte that doesn't need to be set with powder; I only need to touch up after four or five hours and the lasting power overall boasts a significant eight to nine hours, dependent on one's skin type (mine is normal to slightly combination). Below is a quick video showcasing the foundation jars "in the flesh!" Above: A diagram of how the Frame Fix shades corollate with rosy and yellow undertones and lightness and depth of color. 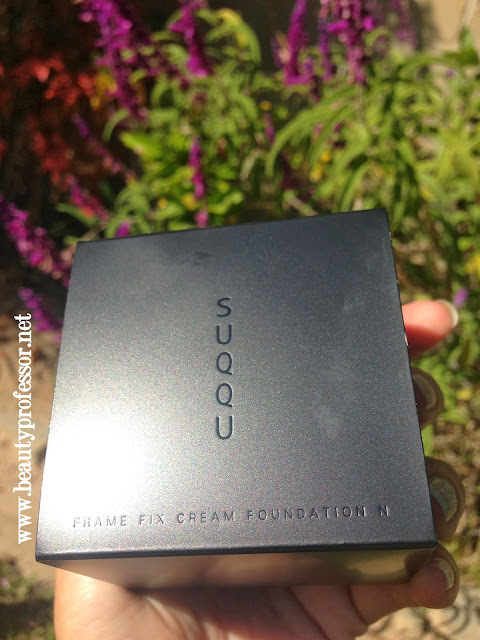 It is essential to note that the Suqqu Frame Fix Cream Foundation shade offerings currently do not cater to dark skin tones. In fact, 003 is one of the darkest shades available (with 203 being a slightly darker, pinker option). As aforementioned, shades 002 and 003 are perfect for my NC 23-NC 30 skin tone variations over the course of the entire year. 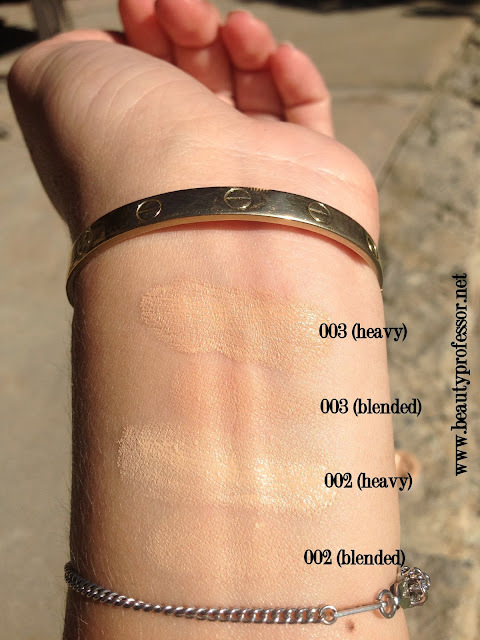 Above: Heavy and blended swatches of 002 and 003 in direct sunlight. Bottom Line: The Suqqu Frame Fix N Cream Foundation truly lives up to its revered reputation. For certain, this luxe and costly formula is an investment, but for those who are able to go the distance and procure it, the payoff is immense. The buildable medium-to-full coverage is so refined and skin like in nature that it is easy to forget that it has been applied! It is highly pigmented, glides on effortlessly, maintains a matte yet slightly dewy finish and doesn't contain added fragrance. While those in the NC 25 range may, like me, find themselves needing two shades to establish a perfect match, I am confident that 002 and 003, both combined and separately, will take me through the entire year of typical skin tone changes. 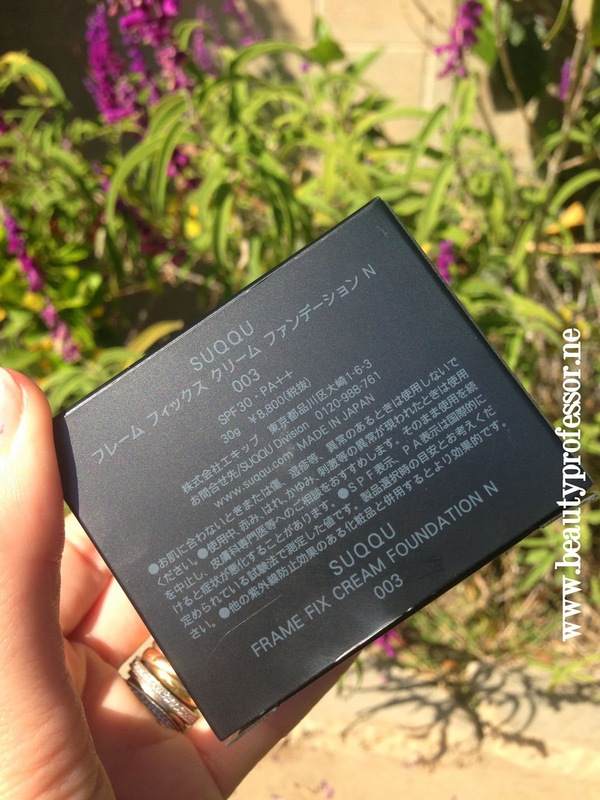 The Suqqu Frame Fix N Cream Foundation is a must for foundation lovers who seek a perfected visage...highly recommended! You look absolutely stunning! I was writing my review on this foundation as well!! I refer to your review on my post, I hope that's ok :) I can't wait to hear about Densiliss Serum Foundation! Which color did you get? Thank you so much, Kate! I look forward to reading your review as well and appreciate you mentioning me in your post! I ended up with the #7 in the Desiliss...tough call but overall the right choice, it seems! Hope your week is going well...xoxo and talk soon! The side of the package that you photographed doesn't show the ingredients, but basically says "In case of an adverse reaction to this product, please refrain from using immediately.. etc". water, cyclomethicone, mineral oil, dipropylene glycol, malitol, ethyl hexyl methoxycinnamate, sorbitan isostearate, tribehenin, vaseline petroleum jelly, polymethyl silsesquioxane, barium sulfate, (dimethicone/ vinyl dimethicone) crosspolymer, hydrogenated lecithin, dimethicone, polypropyl silsesquioxane, trifluoropropyldimethyl/ trimethysilocysilicate, ethanol, prune concentrate, lauroyl-l-lysine, glycyrrhetic acid stearyl, tocopherol nicotinate, 1,3 - butanediol, hydrogenated polyisobutane, geranium extract, butylated hydroxytoluene, phenoxyethanol, chlorphenesin, sodium dehydroacetate, +/- titanium dioxide, talc, iron oxide, mica. Thank you so much for your kind comment! How absolutely wonderful that you were able to translate the ingredients list (impressive to say the very least). Many thanks for doing so and sharing...fantastic! Thanks so much for your extremely helpful review--including the video version. I was going to ask you to compare the Suqqu with the Kanebo Sensai Cellular Performance Cream Foundation--but you already did! Brilliant. It sounds as tho the Kanebo would be better suited to dry skin, so perhaps preferable for me. Would you mind commenting on color for a moment? 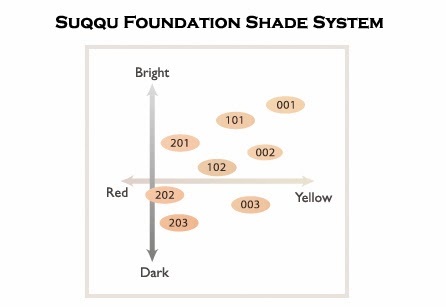 Based on your review and swatches, it looks as tho the Suqqu 002 might match my N 20 skin better than Kanebo's Warm Beige (which looks like it might be very slightly orange for me). Would you agree? Or is the Warm Beige not too peachy/orange? Thanks for sharing your insights on this--and for your helpful reviews in general. My pleasure...thanks for the positive feedback! You are correct...I find that the Kanebo is perfect for dry skin (or "dry skin days") and the Suqqu is better for combination skin since it has a slightly drier (though still creamy!) texture. Yes, I agree that the Suqqu 002 is a spot on N/NC 20 shade and that KS CP Warm Beige definitely leans a bit peachy orange, especially if you are truly neutral. Wow...I am honored to be your first blog comment ever...thank you! I do indeed have a serious commitment (I much prefer that word to "obsession!") to foundation...perhaps to a major fault at times ; ) I am beyond glad that you have found a great formula for your skin in the Kevyn Aucoin Sensual Skin Tinted Balm...that is fantastic! Thanks for the wonderful feedback...I will do my best to keep the reviews coming! How lovely to hear from you! I totally understand how busy life can be, especially in the fall! You are absolutely right, even when you find something exceptional in terms of foundation, the thrill of the hunt and discovery still persist...such is life ; ) Sorry to hear that the GA compact wasn't a win, but I am thrilled that you are still loving the Kanebo! I have a feeling you will also love the By Terry...matte-glowy goodness, indeed! I hope all is well with you and your family as well...thank you for your friendship and support! I hate to be a nuisance and post yet again, but I just had to share! I ordered the foundation from Selfridges in an a foundation induced stupor on Tuesday night, and it arrived today, Thursday Morning!!! I am surprised it wasn't delivered by a Queen's Guard!! You definitely get what you pay for; their service is clearly fantastic!! Off to play! hi strongestore i couldnt help it but ask you how in the world u got the foundation in teo days you mean? How wonderful to hear from you dear friend! I know what you mean...this month or so has been hectic that I go to bed each night wishing for more hours in the day! In response to your question...the Omorovicza BB is a fascinating formula. It is almost gel like in texture and, once it is warmed up in the hands, blends into the face like a second skin. I have the medium shade and I think you would be that as well as I am told that the light shade is very pale. I like using it as a primer or a light foundation and find that it gives a believable skin finish. It is not as radiant as the Peau Vierge (which i tend to use much more often overall)...more like a natural canvas rather than a glowy, luminous one...but the skincare benefits are pronounced. I will say...it does have a rather strong scent (very botanical in nature, rather than "perfumy") but it dissipates fairly quickly and isn't bothersome to me personally. That is fantastic that you bought it at Nordstrom so in case it doesn't work out for you, it will be easy to return or exchange! I hope those details help and that you have a marvelous week...xoxo and talk very soon! I hope your week is going well...xoxo dear friend! Should I pick 101, 102 or 002....So hard to decide when I'm in Melbourne, nowhere to eye the actual shade! I wish I could give you an exact answer but unfortunately I only have 002 and 003 in my possession. If it helps, 002 is exactly NC20 (like Lasting Silk #4) and, by the chart, 101 is a hair lighter (but still yellow in undertone...more like Maestro #2/NC 15). I got the 002 as the 2013 x'mas set, and indeed 002 is a bit darker than my current skin color (but matched my mother perfectly lol), so I am thinking of getting the 101 as well so I can use 101 , or mix with 002 to tailer the color during summer. Got it...hope you are able to get 101, then ; ) I think having both 101 and 002 should definitely take you through the whole year! Hello dear Beauty Professor I hope all is well with you! Good to hear from you! In response to your question, yes, in my experience, the Suqqu 002 and 003 have a more yellow undertone in comparison to the KS CF22's neutral beige tones. I find that the 002 is a NC 20 (light with yellow undertones) and the 003 is about a NC 27 (a touch darker and more yellow than the KS CF22) which is why I mix the two shades. If you are looking for yellow, I suspect you'll be pleased with the undertones of the two Suqqu shades in question! Hope that helps and Social Ecology...how wonderful! First of all, I wanna thank yo for helping me out in Hourglass Immaculate Foundation shade suggestion. I am currently using Le Metier de Beaute #7 ( a hair darker) and the finish is amazing. Do you think SUQQU 003 will be a good match from your experiences on the foundations? My pleasure ; ) In response to your question, I would say that the Suqqu #3 is a close match for the LMdB #7...perhaps just a tad lighter than the #7 overall. I want to ask you which foundation do you prefere, suqqu's Frame Fix N Cream ir Kanebo Sensai celular performace. Do you recomend to buy them both? Hey BP, I'm looking at a bunch of your older reviews as I just put my little 23 month old daughter to bed a little while ago and I love reading your reviews to relax and have a little makeup fun. I have to say every picture you take is beautiful. I love how in depth your reviews are and how many foundations you try out; I cannot imagine that you need them though! Yours is a truly lovely face! My little girl has the same big gorgeous eyes. Anyways, thank you for all the reviews. I have a great list of dying to tries from your blog! Thank you so much for the lovely feedback! I am honored by your kind compliments and appreciate you taking the time to let me know that you enjoy the blog.